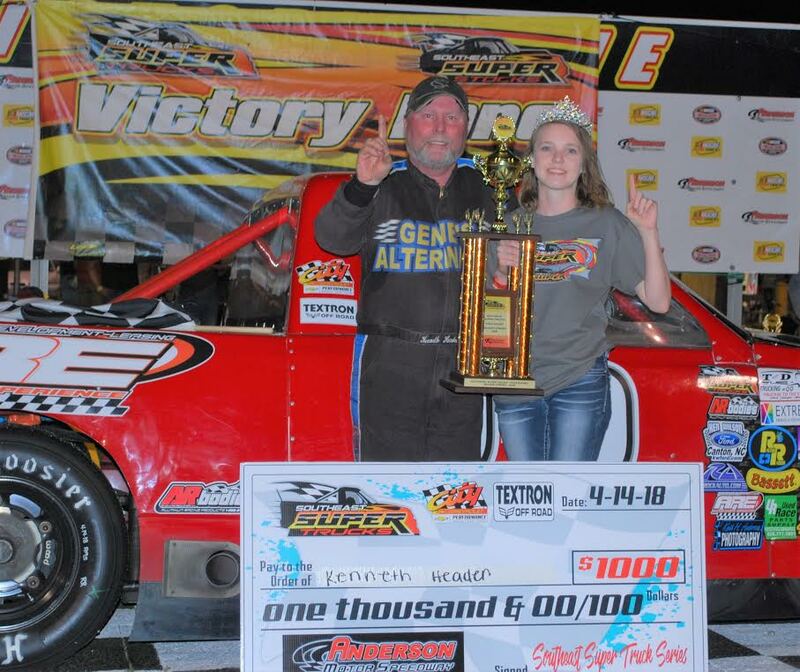 The 2018 Southeast Super Truck Series Presented by City Chevrolet & Textron Off-Road kicked off its seventh season this past Saturday night at Anderson Motor Speedway.. As the team’s and drivers filed into the famous 3/8ths mile oval in Williamston, South Carolina the infield became overfilled. It was going to be a great action packed night, with six divisions racing. Anderson has always produced some of the best races the series has had to date. Short track veterans Kenneth Headen, Randy Porter, Bennie Davis, Ed Surrett, and Ashley Huffman were going to have their hands full as two rookie stand out graduates of the Gripp Energy Limited Late Models were moving up the ranks Ashton Higgins & Sawyer Frady. Not to mention a few SEST series drivers who are on the break through of capturing their first wins in the series Jamie Barbrey, Jimmy Roberts, Toby Hollifield, and Greg Nix. As well as a brand new face to the series this year, and that is of Florida’s own Taylor Hosford. Luke Sorrow showed up in the Troy Carnes prepared truck. The teams unloaded their machines and were set to compete in the first battle of the season. They had a few practice sessions before qualifying Higgins topped the charts for the first round and Sorrow found his way to the top for the final round. However it was Knob’s own Ashley Huffman who claimed the Renegade Race Fuel Pole Award. Huffman rolled a four on the invert dice. This now allowed Jimmy Roberts to start in the captain’s chair. As Roberts was set to lead the field down to the green, he waited for the City Chevrolet pace truck to duck off pit road. However under the pace laps, Roberts experienced mechanical trouble and came to a stop on the back stretch. This now moved the inside row up one row, letting Higgins start from the top spot with Sorrow’s on his outside. As Higgins took the green flag, both him and Sorrow’s raced side by side for three laps before Sorrow took over the top spot. Higgins settled back into the second position, and concentrated on holding off veteran drivers of Headen, Porter, and Huffman. Nix came down pit road on lap 17, ending his chances for the night. Meanwhile, Hosford who started shotgun in the field due to making adjustments after qualifying was picking drivers off one by one. Higgins ducked down onto pit road and parked it for the night due to brake failure. The first caution came out on lap 26, as #8 Ed Surrett came to a stop on the back stretch. Sorrow led the field back to the green flag, unfortunately before the field could complete a lap, the caution came back out again as #5 Toby Hollifield spun coming out of turn four. Sorrow once again led the field back to the green flag. This time with Headen on his outside, Headen was able to take advantage of the front row starting position and took over the lead on the restart. Porter battled with Huffman for several laps battling it out for third. Porter finally was able to capture that position on the track. The third caution flew for the night on lap 39, as #8 Surrett and #20 Roberts got together in turn four, resulting in Roberts going thru a spin cycle. During the caution laps the #99 truck of Sawyer Frady came to a stop on the back stretch, engine mechanical failures ended his debut in the trucks. Headen led the field back down to the green flag, Huffman quickly tried to get around Porter for second, but wasn’t able to capitalize on it. Sorrow worked his way back around Huffman taking over third. Hosford was giving it her all, trying to work her way inside the top five. But Jamie Barbrey who was in the fifth position wasn’t going down without a fight. Headen crossed the start finish line on lap 50, making it 2/3rds way over. Hosford ducked down pit road on lap 53, with flames shooting out under the hood of her truck and ending her night early. Headen went on to capture the first win of the 2018 season followed by Randy Porter in second and Luke Sorrow rounding out the top three.